I am pretty sure there is not a person that does not know the importance of an online presence for a business, especially if the said person is a business owner himself. Your business simply has to be present online if you want to be successful in the modern world. The most popular platform to build a business website with is WordPress, I am positive no one will argue with that. The popularity of WordPress among business owners is very easy to explain, first of all WordPress offers unprecedented range of features, there are thousands of awesome plugins you can use to expend your website's functionality. The WordPress admin panel is amazingly easy to run a website with. But what most users love about WordPress is its template system. In fact, WordPress themes are so popular there are literally millions of them to choose from. No wonder some people get lost in this ocean of WordPress templates and can not decide with which to go with. To make sure you are not among those poor lost souls I gathered 40 of the most recent additions to our collection of business WordPress themes. All of these latest designs are fully responsive, which allows you to completely forego a mobile version of your website, the design will automatically adjust to any screen size. Be it a smartphone, a laptop or a huge screen desktop computer your visitor is using to view the website at - the design will adjust with no casualties in user experience or aesthetics. These WordPress themes come with a huge set of features, including but not limited to multilingual support, image sliders, SEO optimization, easily customizable layout, crossbrowser compatibility, dropdown menu, integrated Google map etc. Being freshly created these business WordPress themes are big for the up-to-date aesthetics. Mostly minimal approach to design and elements of the flat trend will make sure your business website does not look outdated. Well, without further ado - top 40 off-the-shelf WordPress themes for business. Rental Apartment WordPress theme is a great example of what a professionally designed business website should look like - clean layout, balanced color scheme, stylish typography, all these things add up to create the best first impression a business website needs. As the functionality goes - you'll be impressed by the image gallery that uses the hover effect, back to top button, dropdown menu, customizable contact form and many other features. This farming business WordPress theme sports an amazing hero header, in fact it's not just a header - it's a high resolution image slider with a place for your company logo or slogan. This is a great way to make an agriculture business website more exciting. The simple navigation and calm color scheme make this theme a great choice. 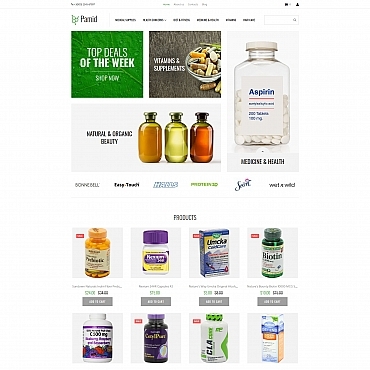 This slick WordPress theme was designed for a company that deals with environmental issues so, naturally, the dominating color here is green. But the amazing features of this template allow you to change the color palette easily as well as customize any other element of the theme. Plus there's a 24/7 support team if you happen to need a hand in the customization process. 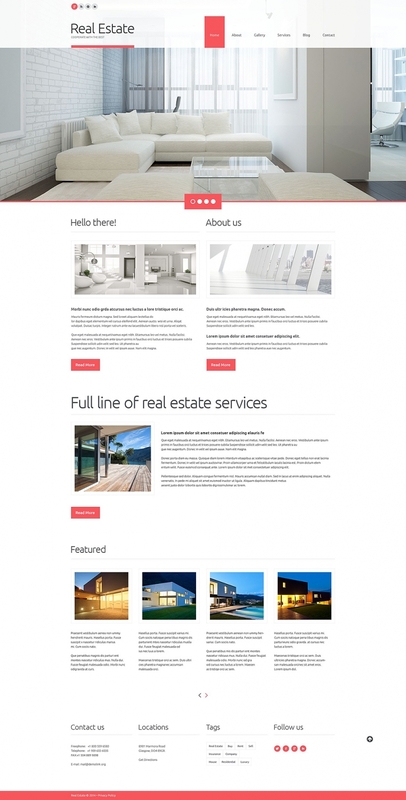 This responsive WordPress theme for real estate business would be a great asset. The design is very aesthetically pleasing, the layout is clean, the navigation intuitive - what else would you need? Well, functionality of course! And you are going to get plenty of that, including an image gallery which type you can change (the choice is among accordion, carousel, isotope and slider), integrated Google map to help your clients find you, dropdown menu, contact form and many more impressive features. 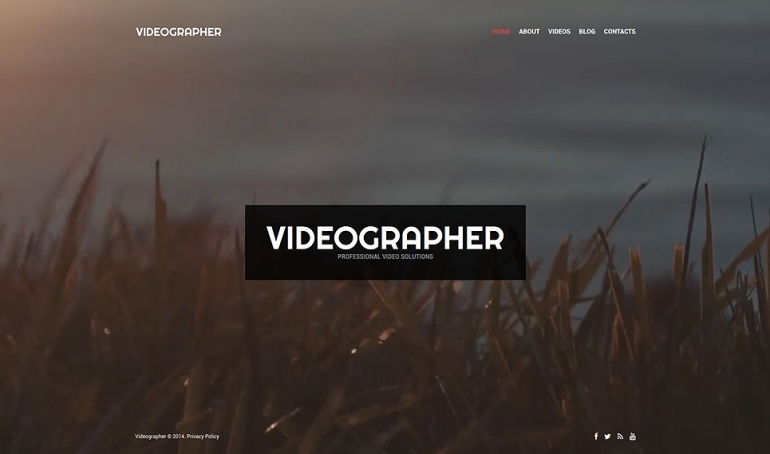 What should a videographer's online portfolio look like? I'm pretty sure the pink and paragon would look just like this Creative Videorgaphy WordPress theme. Impressive home page with video background and a place for your logo, dropdown menu in a horizontal navigation bar, customizable contact form, these are only a few of the amazing features you will get with this responsive WordPress template. 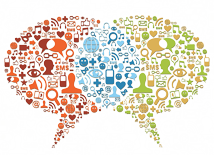 Want to get an awesome and FREE WordPress theme, optimized for social media? Just subscribe to the newsletter below and the theme is yours right away! 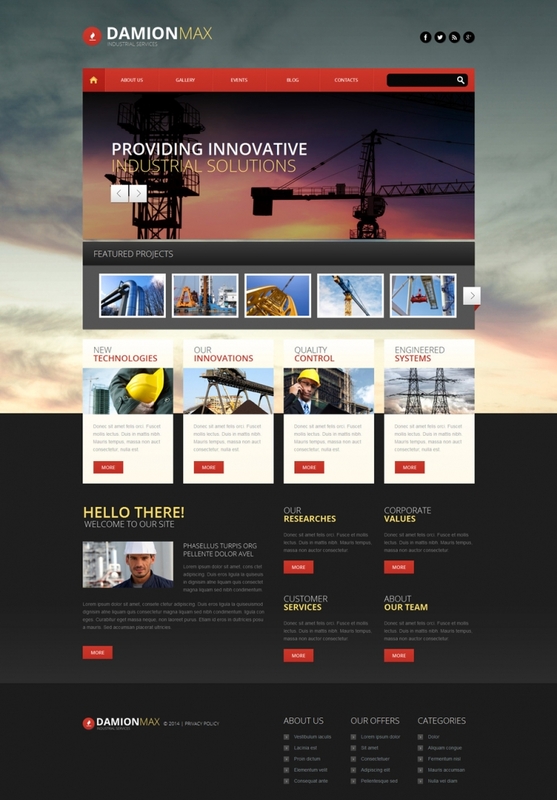 One might think an industrial business website would be boring, this WordPress theme proves that statement wrong. Bold typography, circular elements, high resolution background images, parallax animation effects to create dynamic, wisely used negative space, intuitive navigation and clean layout, these are just a few things that make this construction company WordPress theme modern and not boring at all. 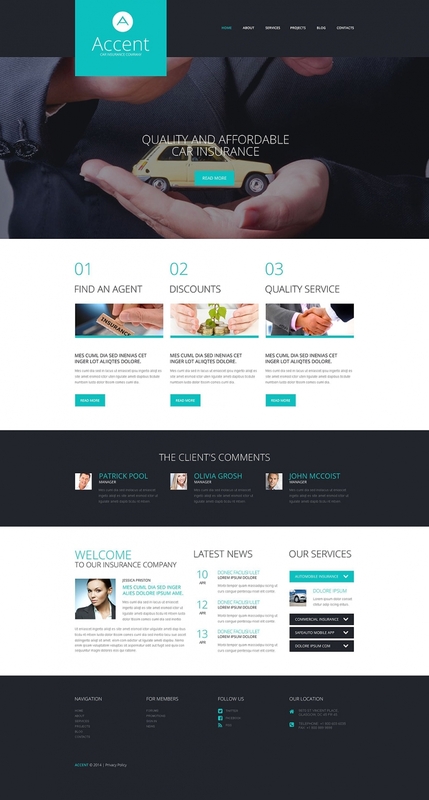 Financial consultant WordPress website template is a great way to build your business online. The simple design and clean layout make it look professional, yet not boring due to the wisely used modern design elements. The navigation is very intuitive, the functionality of this theme is incredible, try it out in the live demo! 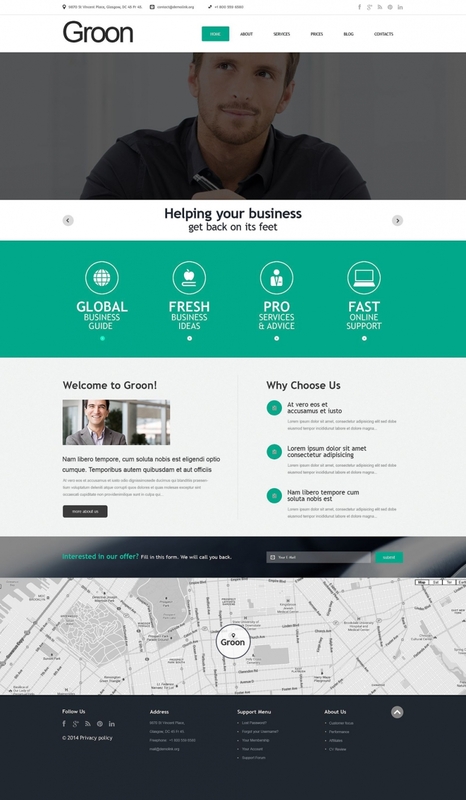 This slick WordPress design will be a perfect fit for a computer repair business, or any other IT business. The theme is very easy to customize, plus there is a 24/7 tech support available if you happen to have any questions. Insurance Agency WordPress theme has every feature a modern, up-to-date business website should have - trendy color scheme, hero header with logo area, drop down menu, intuitive navigation, there's even Google map integrated. Take a closer look via the live demo! More and more people look for jobs online, job portals is a growing market. If you plan on joining the business we strongly recommend this WordPress theme. Our designers have considered everything a job portal might need and implemented it all in this theme. Check it out for yourself in the live demo. 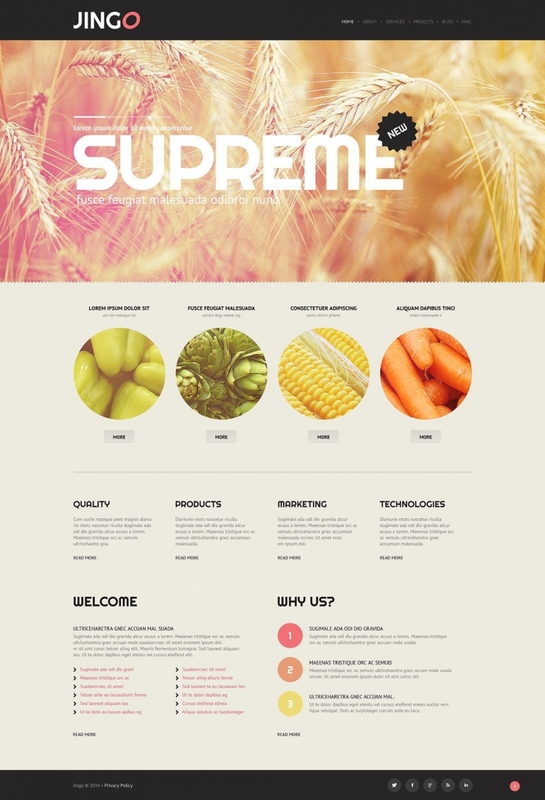 You might think an agriculture business website would be boring, this WordPress theme proves that impression wrong. Full resolution background images, modern typography, circular elements, parallax animation effects, easy navigation and clean layout, these are simply a few things that help make this agriculture company WordPress theme not boring at all. 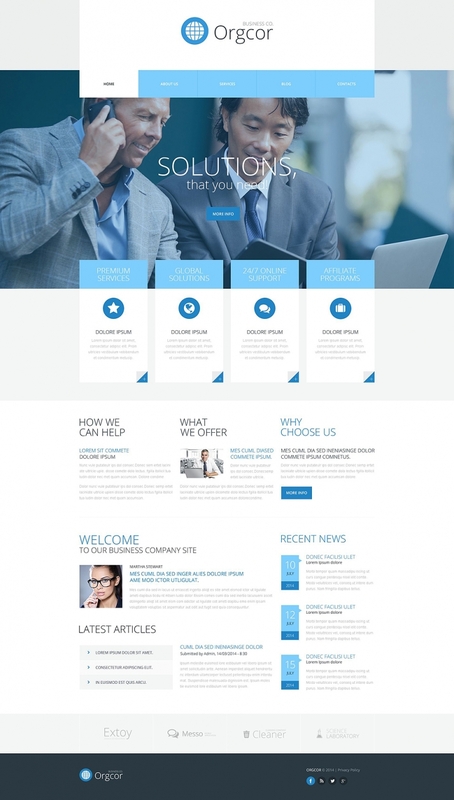 Blue is believed to be the best color for business websites, if you want your business website to look professional and sophisticated choose a template in blue and white color scheme. 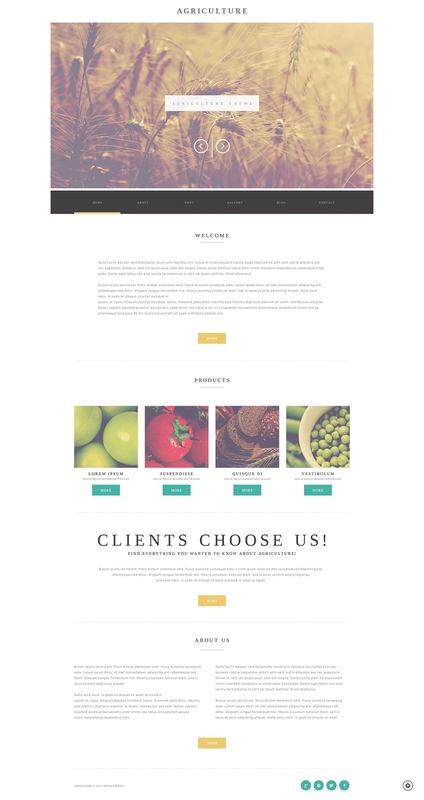 This business WordPress theme is a great example of such a web template. The huge slider at the top of the home page, the simple yet stylish icons, modern typography, all these things add up to create a perfect business website. 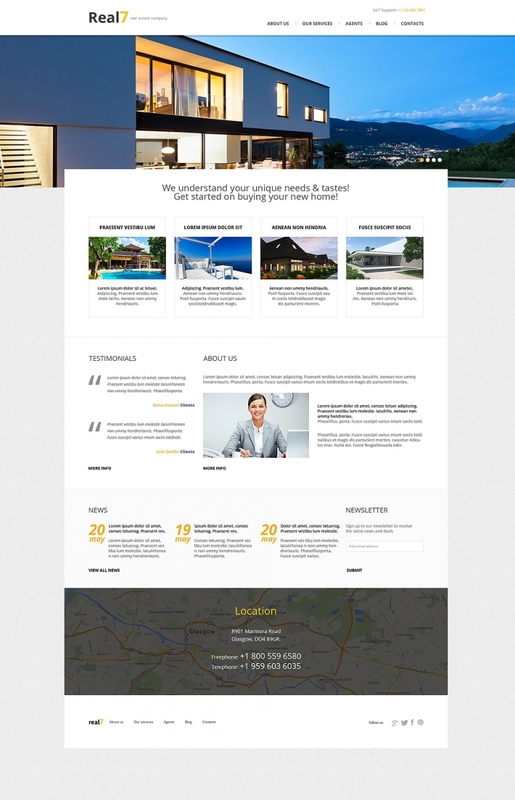 Real Estate Company WordPress Template makes a great use of hero header, that is so popular these days. The gallery type can be chosen from accordion, carousel, isotope or slider, there's a drop down menu and a customizable contact form. Plus there's an integrated Google map to help your client find you offline. This blue and white WordPress template is a great example for a minimalistic approach to web design. The theme implements all the latest design trend perfectly - a big image background, big header area with a space for your logo, horizontal navigation bar with drop down menu, these are just a few. You can check them all out in the live demo! Videography Portfolio is the best way to showcase your video masterpieces. There's a simple gallery to store your works, intuitive navigation to make sure your visitors don't get lost in your portfolio, there's also a tag cloud to help you with that. Contact form and Google map will help your clients hire you. all in all - a perfect choice for an online videography portfolio. Someone may believe a business web page will probably be lifeless, this WordPress theme confirms that fact incorrect. Gorgeous typography, rounded elements, full resolution background photos, parallax animation effects to create dynamic, sensibly utilised negative space, intuitive navigation and clean style, these are merely several things that make this business WordPress template cutting-edge and not dull or boring at all. People who own any sort of businesses, from major corporations to local stores, need to keep their locations nice and clean. To provide an enjoyable environment both for staff as well as clients, they turn to cleaning agencies. Should you wish to assist the latter get more clients, choose this template. With this WordPress theme the advertised business will appear reliable, and that is certain to allow the said business to get the possible clients' trust. Browsing the lovely photos highlighted with vivid colors, readers will understand that cleaners truly appreciate the work they do. 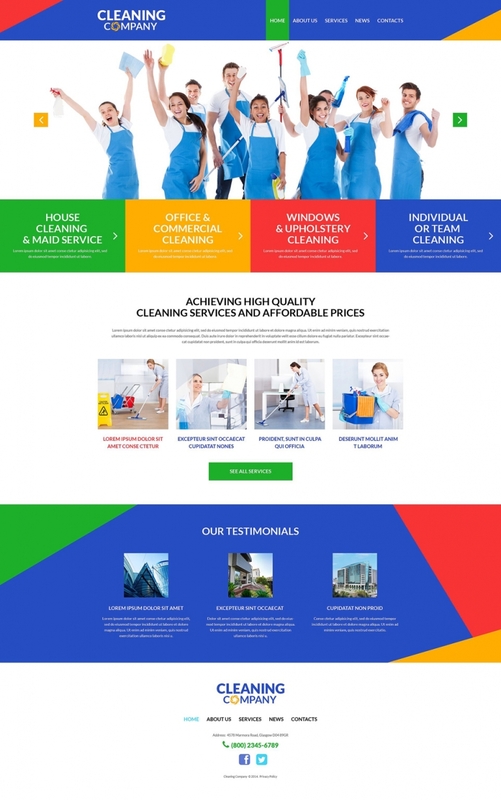 Take advantage of this web template to reassure people that there won't be any dust in the workplaces after the staff of the promoted organization clear every little thing there. 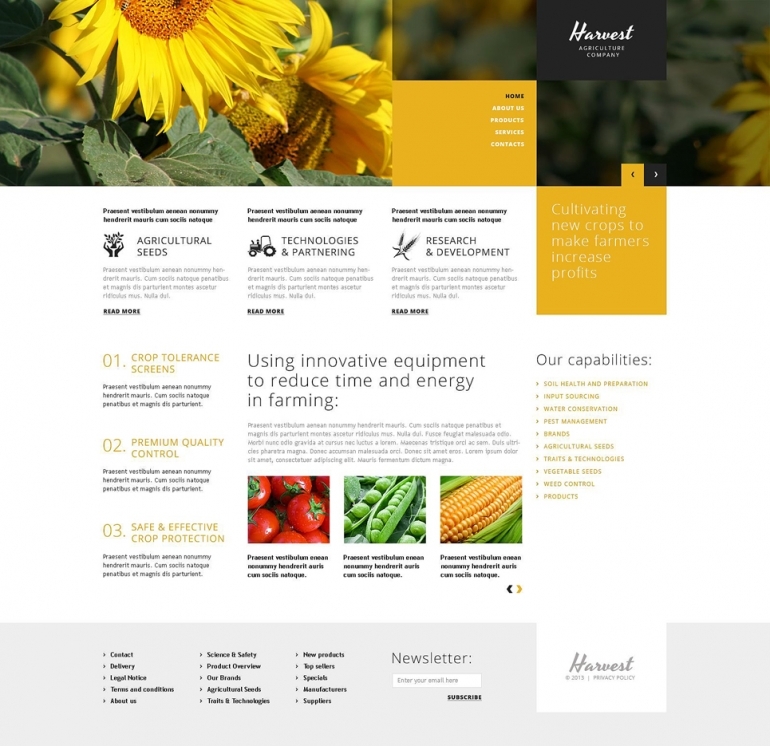 This incredible WordPress theme was designed for online agricultural companies, it has everything such a business might need - from modern design to user-friendly navigation. 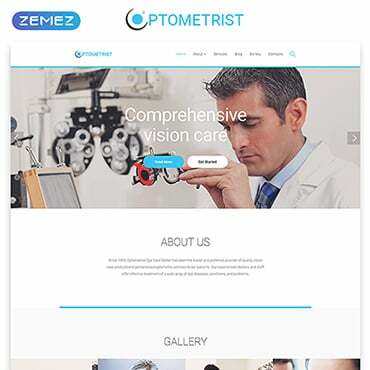 The theme will provide your online business with great functionality - there's a customizable contact form, back to to top button, dropdown menu, 4 gallery types to choose from etc. Satellite TV WordPress template has audio player and video integration to expand your media business website functionality even further. The color scheme can be easily customized to fit your brand, the features this theme offers include back to top button, drop down menu, integrated Google map, 4 types of image gallery you can choose from, tag cloud and many more. The business world is very competitive, you need your client to take you seriously. This WordPress theme will definitely help you gain the trust of your existing clients and attract attention of new ones. The color scheme is sophisticated, yet not boring, the content areas are arranged in the most comprehensive way, the buttons are big enough no one will miss them. The amazing big header grabs the visitor's attention, so you should use it to present the most important things your business offers. This advertising company WordPress template has an incredible minimalistic design and very clean layout. Even the most creative types won't deny this is a brilliant design. The theme possesses not only the aesthetics but an incredible functionality as well. The navigation is user friendly and intuitive, the design in 100% responsive, there's a customizable contact form and integrated Google map. Check it all out yourself at the live demo! Attorney websites are usually dull and not memorable at all. Well, not this one. The impressive photo background won't let your website visitor's forget you. the theme is fully responsive and cross browser compatible, there's a contact form set up and many more features - go try them out in the live demo. 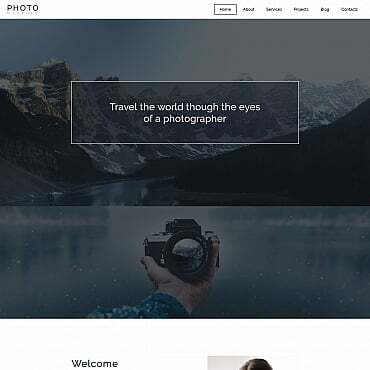 This slick WordPress design uses both a photo background and a hero header and I have to say - this is a brilliant move to make sure your customers are impressed by your web presence. The theme was designed for an industrial company and has everything such a company website might need, from the drop down menu to integrated Google map. I'm pretty sure a perfect job portal website would look exactly like this WordPress design. The red and grey color scheme evokes emotions but does not look unprofessional, it is a very stylish combination indeed. You can try the theme out in the live demo. Looking for a stylish and modern design for your online business? You've found it! This WordPress theme has very trendy color scheme, clean layout and such up-to-date design elements as hero header, circular elements and integrated Google map. As functionality goes - the theme is fully responsive and 100% cross browser compatible, there's a contact form and 4 types of image gallery you can choose from, and many more useful features. 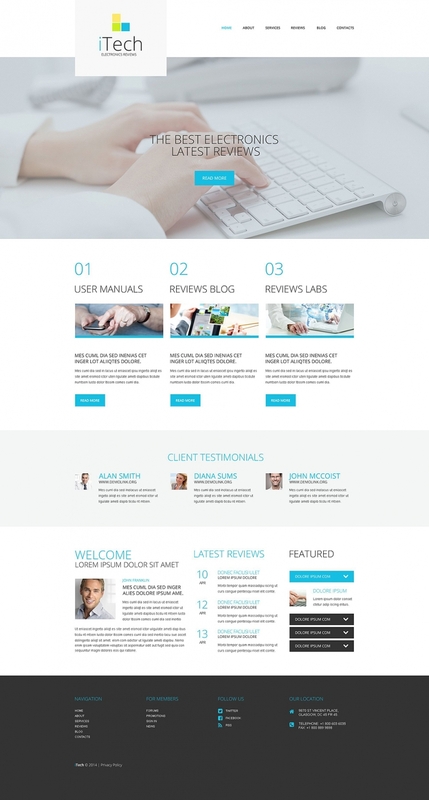 The main color of this dentistry WordPress template is green but you can easily change it to anything that fits your brand. The clean layout, intuitive navigation and drop down menu make this theme a perfect choice for a dentistry of any size. Hair transplantation is a growing market, if your business is a part of this market and you look to expand it online this WordPress theme is your best choice. Designed specifically for a hair-related business the theme provides a wide range of features you can use - integrated Google map tolp your clients find your clinic, contact form to help them reach you, amazing gallery to show the world the results of your work etc. This business wordPress theme is a great choice for a company of any size. Local small business or huge enterprise, or something in between, any business will definitely benefit from an online presence like this. The very modern and clean layout looks reliable and trustworthy, the responsive nature of the theme will make sure any screen size can accommodate your website and the amazing features you'll find this theme possesses will make running a business website easy and fun. I don't know about you but I am impressed with this WordPress theme. Who knew a business website could look this amazing? The huge image backgrounds, the content blocks, the smart use of typography - everything about this business theme is stylish and professional. 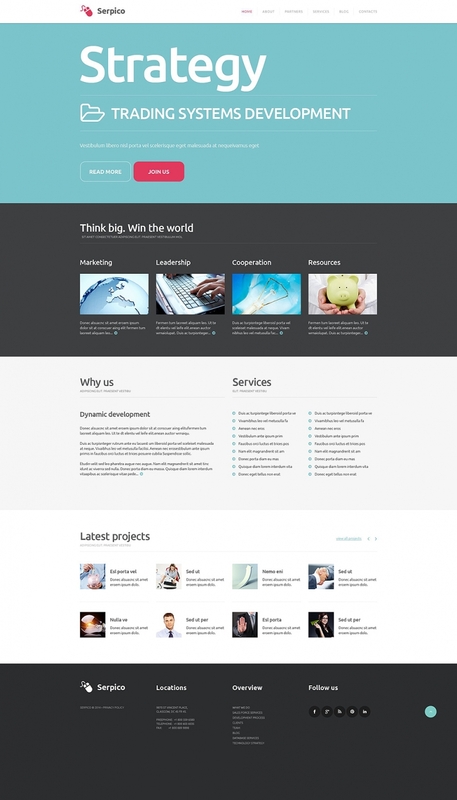 This business WordPress template will definitely become a solid web presence for some business. A real estate business website has to be particularly trustworthy and user friendly. 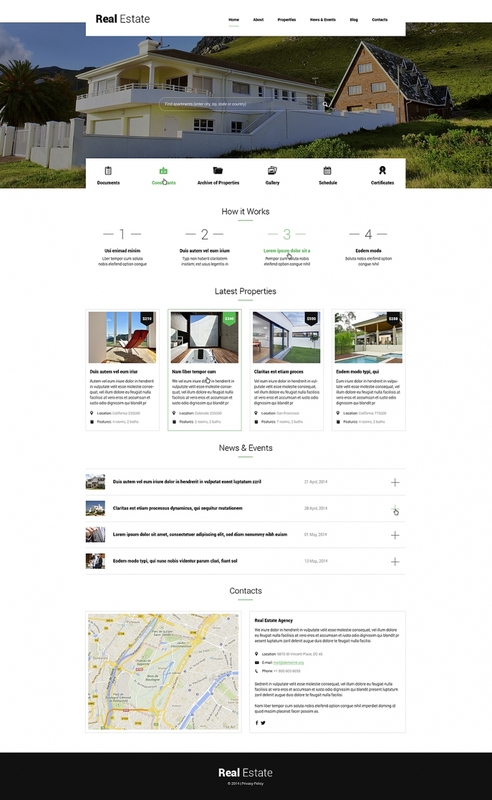 This real estate WordPress theme will make sure your online business is just that - reliable and user friendly. There's a number of gallery types you can choose from to make sure you show your apartments in the most efficient way, there's an integrated Google map to help your clients find your office and many more amazing features. 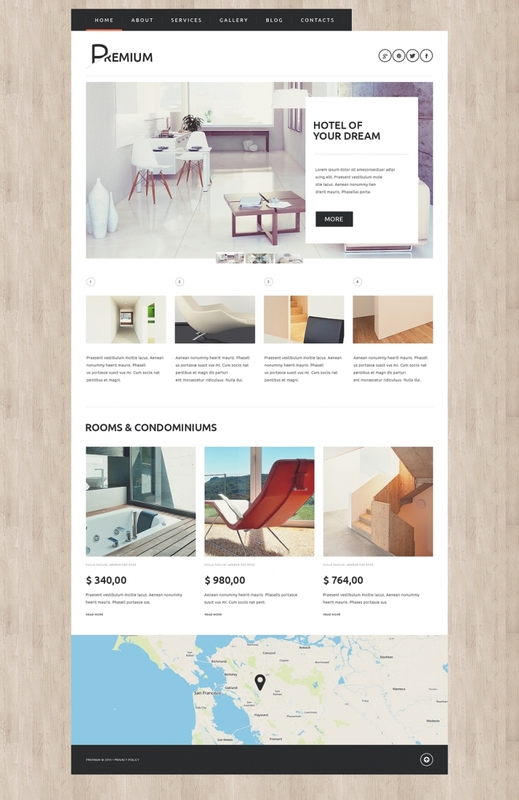 This renting flats WordPress website template is a new word in web design. This clean layout incorporates such amazing trends as high-res photo background, equipped with a slider, an innovative ghost-style search bar, parallax animation effects, stylish animated icons and slick typography. 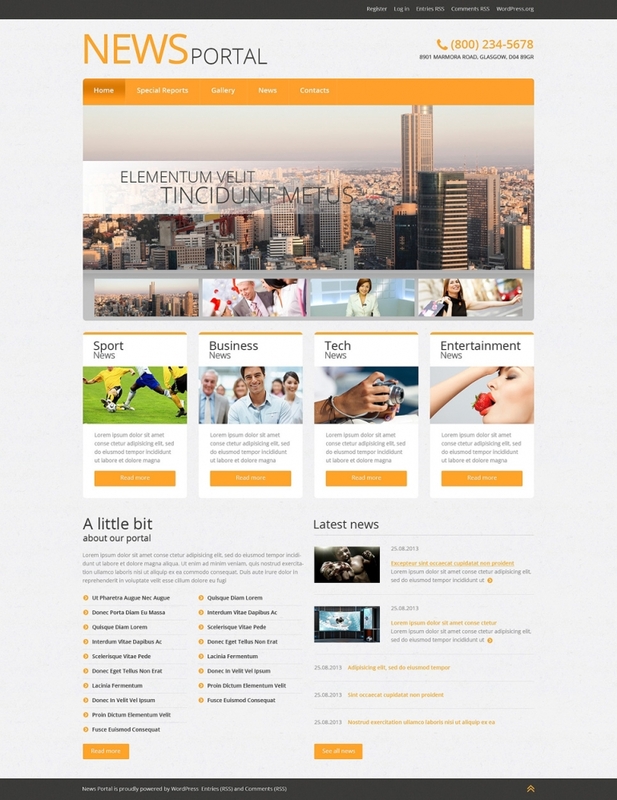 The theme is dynamic yet the effects are not overwhelming, making it a great choice for any modern business. Huge image slider at the top of the homepage, fascinating parallax animation effects and perfect use of green color make this translation agency WordPress theme exceptionally captivating. Check out all the features the theme has to offer in the live demo! 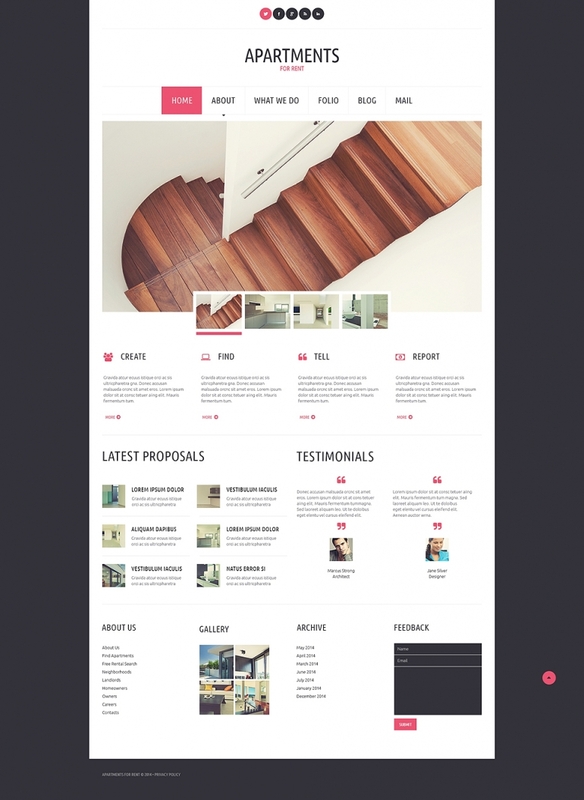 Here's a perfect example of a flawless business WordPress theme. This clean layout was designed to fit a real estate agency, but can be customized to accommodate any business related to architecture, interior or exterior design. The theme is executed in white with clever use of pink and black elements. International Relations is made to become a perfect online residence for any type of international corporation. The minimalistic and clean design is a subtle combination of the most recent design trends, which will make sure your business website won't look outdated, yet the trends used here are not overwhelming. More and more people stop underestimating the importance of travel insurance, thus making the travel insurance a rapidly growing market. If you need to expand a travel insurance business and are looking for a WordPress theme to accomplish this - stop looking, you've found the perfect theme for vacation insurance business. What is the best way to provide every traveller with an insurance package? Via an online presence of course! And this WordPress theme is the best way to establish such a presence in a few easy steps. This fully responsive theme is ready-to-use, you just need to fill it with your content, our designers have already done the rest for you! A media company of any size, from a local newspaper to a huge international media corporation could benefit from this WordPress template. The bright color scheme, the high resolution image gallery along with a number of slider types you can arrange the pictures into, the drop down menu, all these things add up to create an amazing media website. Hotels Booking Agency is a 100% responsive WordPress theme, that utilizes such amazing features as cozy wooden texture background, big image slider, built-in Google map and dropdown menu. The theme is easy to customize to perfectly fit your business and bring people home away from home in the most efficient and stylish way.